CARTHAGE [Missouri] -- Two Webb City men were arrested and charged with forgery after allegedly trying to pass a false check for paint at a Wal-Mart Supercenter in Carthage on Jan. 5. Police said their plan was foiled when a clerk noticed that the bank's name was misspelled. Instead of First State Bank of Joplin, the check read "Frist State Bank." Store managers recognized the check as being similar to one used Jan. 2 to buy a pen and a day planner. They turned both checks over to police. Nicholus E. Newman, 21, and Seth M. Reeder, 24, were released on bond Monday. Their arraignment dates had not been set. Police said the men used a computer program to create the two checks on a nonexistent bank account. First, to make such a mistake is inexcusably stupid. If you were these idiots' parents, wouldn't you be ashamed? But second, and worse, if you're going to expose yourself -- not once but twice no less, and at the same store, no less -- to being convicted of a felony and to prison time, shouldn't you steal more than a pen and a day planner and some paint? Some criminals are masterminds. Others are not so much. 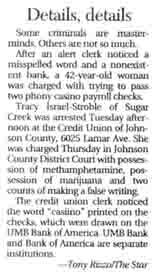 After an alert clerk noticed a misspelled word and a nonexistent bank, a 42-year-old woman was charged with trying to pass two phony casino payroll checks. The credit union clerk noticed the word "casiino" printed on the checks, which were drawn on the UMB Bank of America. UMB Bank and Bank of America are separate institutions.